Meet Leah, the New Design Project Coordinator for Eureka Crystal Beads! 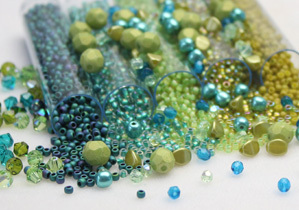 Eureka Crystal Beads is a crystal and beading supply company. Browse our easy to use webstore or come visit us in person at one of the 20+ shows we do throughout New England and the Mid-Atlantic. We are committed to bringing you the best selection of the highest quality beads and components at the lowest prices possible! We carry an astounding assortment of Swarovski crystal beads and pendants. We are also constantly updating our inventory of Czech crystal, both firepolish and pressed glass beads, in addition to findings, rondelles, pattern kits, stringing materials and more! I own a jewelry business and purchase from you at the Bead Expo. Your website is lovely, but I cannot figure out how to order from you. What am I missing? Just go to our webstore at http://www.eurekacrystalbeads.com and browse for the items you want to purchase, then add them to your cart. I really liked the swarovski trend chart you had for last year, is their one for this year and upcoming 2012?